"I don't think it is difficult for this large Indian State to accommodate Kashmiris, to let him have his dignity and give honour and not rub his nose any further into the ground," A S Dulat -- former chief of India's external intelligence agency, the Research and Analysis Wing and then prime minister Atal Bihari Vajpayee's advisor on Kashmir -- tells Rediff.com's Syed Firdaus Ashraf and Saisuresh Sivaswamy in the concluding segment of a four-part interview. Is there a Modi doctrine on Kashmir or Pakistan? I don't think there is any Modi doctrine on Pakistan or Kashmir. Kashmiris were hoping that Modiji would have followed Vajpayee in Kashmir. If he had followed Vajpayee in Kashmir, then there would have been absolutely no problem in Kashmir. He was in a more powerful position than Vajpayee. In fact, when he won, Mirwaiz (Umar Farooq) was one of the first persons to congratulate him. He said we are looking forward from Modi on what Vajpayee started (the peace process). 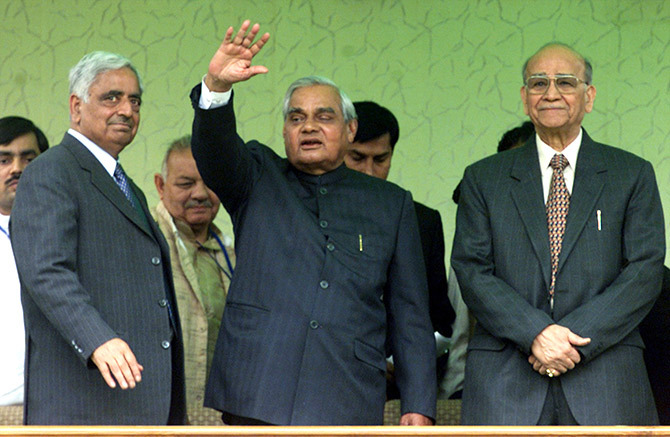 If you go to Kashmir, there is no two ways about the kind of affection Kashmiris have for Vajpayee. You don't see it for any other leader. Whatever solution comes up for Kashmir, it will have to have the backing of the rest of India. Given that this a government with a strong Hindu backing, won't any concession with Muslim Kashmir meet with pushback from the electorate? Not in the least. That is the other thing we need to understand. When this whole uprising began in 1989-1990 there were only a handful of boys of the JKLF (the Jammu and Kashmir Liberation Front) to begin with. They started believing that they are going to get independence as someone on Pakistani side told them that you start and we will follow. Now the 10 year old with a green flag does not know what azaadi is. He is a kid. I would say basic azaadi which the Kashmiri needs, which will not cause any ripple in the country is, give him space, give him dignity, give him honour and give him justice. That is the best way and the first thing to do to move forward. After that, think about what kind of autonomy they want and what kind of autonomy India can live with. As the Kashmiris say, it is just their bad luck. I don't think it is difficult for this large Indian State to accommodate Kashmiris, to let him have his dignity and give honour and not rub his nose any further into the ground. What Kashmiris hate so much is a feeling of a sense of defeat. We did so much, we sacrificed so much and what did we get, nothing but defeat. Kashmiris have been defeated militarily by India. Again, it is the same thing. Why do you want to state the obvious? Not only the Kashmiris, but also the Pakistanis realised that you cannot gain anything by force. Therefore, (then Pakistani military dictator General Pervez) Musharraf came to this conclusion that India is too big as a country and they need to have good relations with India and move forward in Kashmir. But Kashmiris attack our troops, shout slogans of azaadi! It is a two way thing. It is not that the Kashmiris just come and pelt stones on the CRPF (Central Reserve Police Force). If that is happening, then it only shows the extent of alienation the Kashmiris feel. I feel a lot for this poor CRPF chap who comes to Kashmir to serve the country. Take, for example, a boy from Kerala who is posted in Kashmir in the CRPF. He does not know anything about Kashmir. He then stops a Kashmiri and ask for his identity. This argument happens and then force comes into the situation. This situation has been brought upon them by the Kashmiris themselves. India has always given subsidies to the Kashmiris and many other things. We give them everything, but we do not talk to them. We do not involve them politically. Now see, there is a PDP government in Kashmir and Farooq Abdullah is a much taller leader. Nobody consults him, nobody talks to him. Should he not be consulted? It is a question of huge distrust. As chief minister Dr Abdullah was busy playing golf. People used to hate him. I saw this first hand when I visited Kashmir many years ago. The people of Kashmir don't hate him, you got it wrong. And he is entitled to play golf. Kashmir's Atwal Moment: Govt must act now!